Pecan Pineapple Carrot Cake with Vanilla Buttercream Frosting. 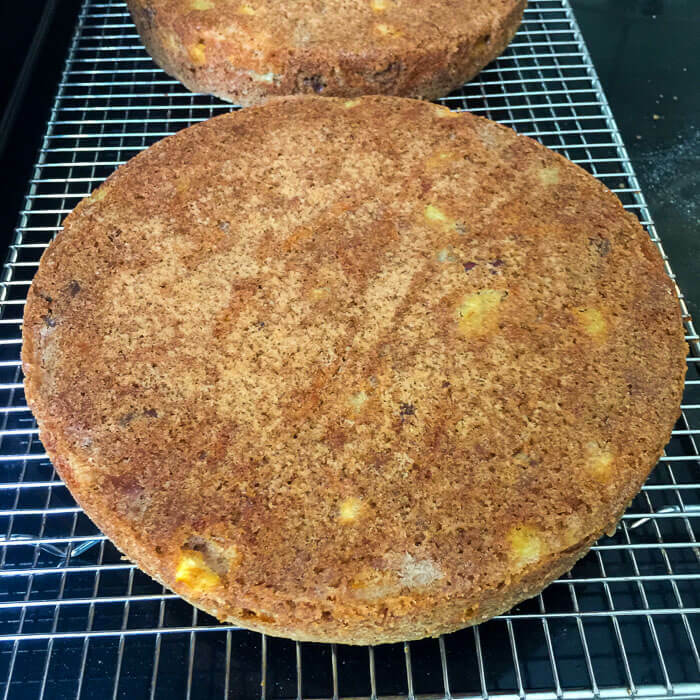 My favourite version of carrot cake featuring a moist spice cake base with sweet golden pineapple and crunchy pecans. I love to make an Italian buttercream frosting for this cake instead of the traditional cream cheese frosting. Originally published 20011. 2017 update to include baking notes for ingredient measurements and adjust the baking soda amount slightly. New photos are also added. 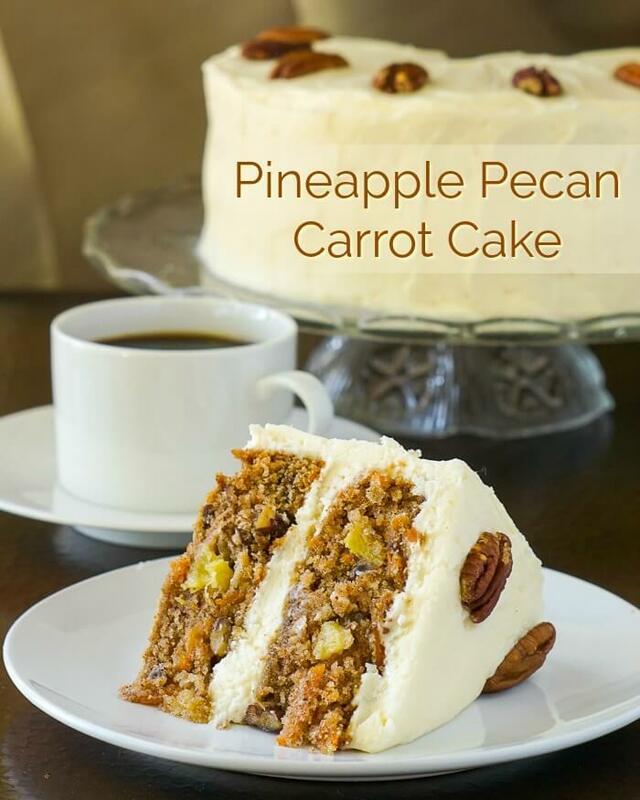 This pecan pineapple carrot cake is probably my favorite version of this classic dessert cake. It does not sway too far from a traditional recipe but does add some fresh golden pineapple for added moisture and outstanding flavour. The lightly toasted pecans pair perfectly with the spicy carrot cake too. 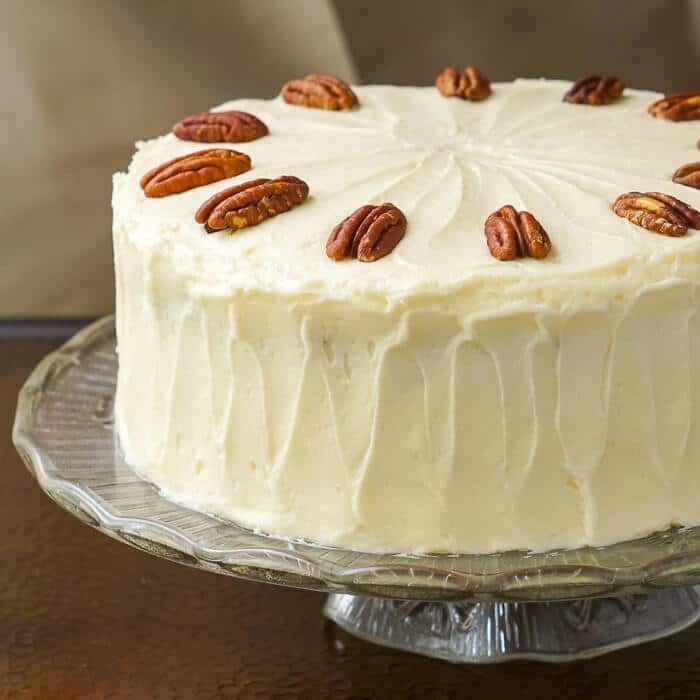 You can use your favorite cream cheese icing to fill and cover this cake of course but just to change it up a little, some luscious vanilla buttercream frosting is also excellent on this scrumptious cake. 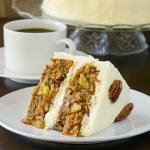 Like this Pecan Pineapple Carrot Cake recipe? You’ll find many more amazing cake recipes in our Cakes and Pies Category and even more indulgent ideas in out Desserts Category. If you’d like the recipe for cream cheese frosting instead of the buttercream frosting you’ll find it with our Sticky Toffee Banana Cake. Pecan Pineapple Carrot Cake, so moist and tempting. My favorite version of carrot cake featuring a moist spice cake base with sweet golden pineapple and crunchy pecans. I love to make an Italian buttercream frosting for this cake instead of the traditional cream cheese frosting. 1 cup fresh golden pineapple diced small (see note) Use canned pineapple tidbits only if fresh is unavailable, roughly chopped and then pressed through a sieve to remove the excess liquid. Grease and flour two 8 or 9 inch cake pans. Sift together flour, baking powder, baking soda, cinnamon, nutmeg and salt. In a large mixing bowl, beat the sugar, eggs and vanilla and oil until light and fluffy. Stir in the grated carrots, pineapple and nuts. Fold in the dry ingredients by hand. Stir only until the dry ingredients are incorporated into the batter. Do not over mix. Pour into prepared pans and bake for 30-35 minutes at 350 degrees F or until a wooden toothpick inserted into the center of the cake comes out clean. Meanwhile beat the egg whites, cream of tartar and vanilla extract together to stiff peaks with the whisk attachment on your mixer.. When completely cool, slowly begin to add a few tablespoons of the butter at a time, beating constantly. Beat until smooth after each addition. When properly done, the texture of this frosting should resemble whipped cream. If storing in the fridge, you will want to bring the cake out to come up to room temperature before serving. Be sure not to overmeasure the amount of pineapple and grated carrot in this recipe or your cake could get soggy and/or crumbly. I made the mistake once of adding more pineapple and it ruined the cake. Also, use the large side of the grater, and only lightly pack the grated carrot to fill 1 1/2 cups. Finely grated carrot will also introduce too much moisture into the cake. What’s your BESTEST frosting recipe to go with this cake Barry? Nummy! This looks delicious! Made a carrot cake last week. They remind me of when I was just toddling around. 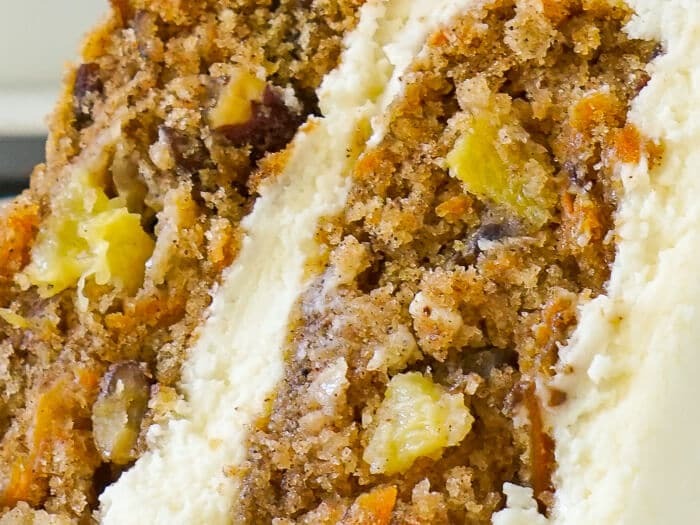 I always smile when I see carrot cake, it’s basically the dessert that was the star of my younger years! wow, that sounds delicious 🙂 Yum! I love a good carrot cake!! I love how thick your frosting is on top. I am assuming you used a cream cheese frosting? It looks delicious. They are similar but Hummingbird cake is a banana cake. Going to make this cake today but want to put a cream cheese frosting on it, what’s your best Cream Cheese Frosting Recipe? Made this cake twice last weekend for 2 events. Paired it with cream cheese brown butter icing…delicious. Hi Barry, is the Butter Cream frosting recipe you provide the Italian Butter Cream you’re referring to? I ma wanting to do this for my Easter tea party. I have mini cake pans and was wondering if you think they would bake okay as minis? I guess, just watch them carefully and of course the time will be much shorter.